The highly anticipated rollout of Fortnite: Battle Royale for Android is upon us. Today, Samsung and Epic Games announced they're letting Samsung Galaxy device owners (of Galaxy S7 or better phones) sign up for the chance to play a beta version of Fortnite for Android. Invites will go out to players over the next few days. You can check out gameplay in the video below. You'll notice the special edition Galaxy skin, which will be available only to owners of the Galaxy Tab 4 and Galaxy Note 9, which launched today. For an invite to play, you'll need to sign up on the EpicGame.com site. Once you're accepted, you'll get a link to download and install the game on your phone. Fortnite for Android won't be available through the Google Play store. After the initial rollout to Galaxy devices, owners of high-end phones will get a chance to play. Compatible devices include Google: Pixel / Pixel XL, Pixel 2 / Pixel 2 XL, LG: G5, G6, G7 ThinQ, V20, V30 / V30+, ZTE: Axon 7 / 7s, Axon M, Nubia / Z17 / Z17s, Nubia Z11 and the Huawei: Honor 10, Honor Play, Mate 10 / Pro, Mate RS, Nova 3, P20 / Pro. See the full list of compatible phones. 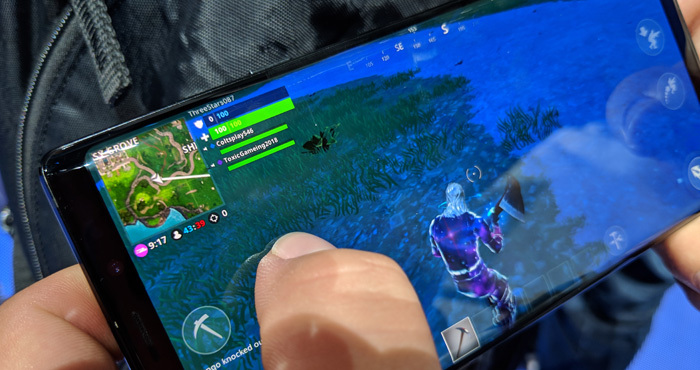 When Fortnite for Android launches, there won't be support for voice chat, Bluetooth controllers or Save the World. Android players will only be crossplay with other mobile players. But, like with the iOS version of Fortnite, these and other features will roll out over time.